Is it wrong for Christians to celebrate Christmas? I hear this question from time to time and I thought I might address the matter. I hope you find it helpful. The answer to whether a Christian should or shouldn't celebrate Christmas depends on how they approach it. The reason I say that is because the Bible does not speak of a holiday to celebrate the birth of our Savior. In fact, the observance didn’t make its way into the church until around the 5th century. The origins of Christmas are rooted in pagan traditions before the church era. But that doesn’t necessarily mean that it's wrong to observe a national holiday. Truth be known, there are many things that we observe today that have their roots in pagan traditions. Did you know that the names for the days of the week come from pagan beliefs? For example, Saturday comes from the worship of Saturnus. Friday comes from Fria, the goddess of love. Yet, when I observe Friday or Saturday, I’m in no way participating in pagan worship. We need to be careful and guard against becoming hyper-literalist in the use of scripture. To do so is to miss the spirit and the intent of the letter. Some will quote Jeremiah 10 which they believe condemns the celebration of Christmas and especially the use of the Christmas tree. But is Jeremiah telling us to avoid the customs of the nations? No, he’s speaking against the making and the worship of idols. In reality, the celebration of Christmas does not clearly fall into a right or wrong category in the Bible. And the Apostle Paul addresses these 'gray areas' in his letter to the Christians in Rome. In other words, we have freedom to decide whether we will observe a special day or not, only, don’t look down upon those who see it differently than you. The key is in why you are observing Christmas? Can we get lost in the commercialism and holiday trappings of Christmas? Yes, and we need to guard against it. But observing a national holiday doesn’t mean we ascribe to the worship of an evergreen tree. Christmas for many is just an opportunity to reflect upon, and celebrate ‘God with us’! In fact, there are some very good reasons to celebrate the birth of our Savior during the Christmas holiday, if you choose to do so. • It is a wonderful reminder of God incarnate – Immanuel! Didn’t the angels make a big announcement to the shepherds of this all-important event? • It is an opportunity to clarify our worship of our Savior and reflect upon the gospel. 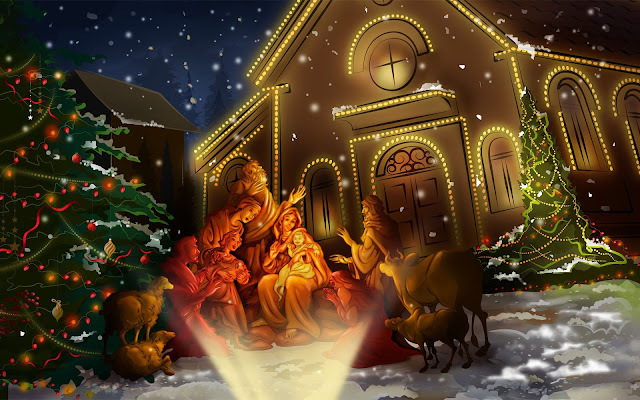 The shepherds are recorded as immediately leaving their flocks to come and worship the Christ-child. • Also, people tend to be more open to the gospel during the Christmas holidays. We should take advantage of that openness to witness to them of the saving grace of God through Jesus Christ. Christmas is chiefly about the promised Messiah who came to save His people from their sins (Matthew 1:21). The holiday provides us with a wonderful opportunity to share this truth. We would be wise to remember the words of the Lutheran theologian, Rupertus Meldenius, who said that in the essential matters of our faith, we must be unified! And in the non-essential matters of our faith, we should walk in liberty. But in all things, we should love one another! Written by: Pastor Greg Sempstrott, Senior Pastor of First Church of God Vero Beach. According to a 2015 report by the Barna Group, commissioned by the American Bible Society, 88% of American households own a Bible. For those households owning a Bible, 39% enjoy a King James Version, 13% possess a New International Version Bible, and 10% of those owners are reading from the New King James Version as well as the English Standard Version. Also appearing in that study was that 13% of American adults purchased a new Bible in 2015. Out of those new Bible sales, the NIV led the sales charts in both dollar sales and units sold. With over one hundred versions of scripture in print, what has drawn 70% of Bible readers to four translations? Why has one version of the Bible dominated the market for decades? For Christians living in the 21st century there are so many options to choose from when it comes to translations of the Bible, what attributes are Bible reading Christians looking for when selecting a Bible? There are three main components to selecting a translation of the Bible; origin of manuscripts used for translation, method in which the translation was done, and reading level of the Bible. Understanding these three topics should provide insight for readers as to how their Bible was composed and for selecting a translation for study. The translators of most English translations of the Bible use the Masoretic text as their primary source for the Old Testament, but will use the Septuagint and other sources to critique and analyze the Hebrew text. Although there are some Bibles in publication that use the Septuagint as its main text for translation, they consist of Bibles such as The Septuagint Bible and The Orthodox Study Bible, mostly found in English speaking Eastern Orthodox churches. The Samaritan Text, while not widely used for translation, has sparked many debates since its discovery in 1631. A majority of the controversy stemmed from Roman Catholics and Protestants, as scholars on both sides argued the validity of the Samaritan text in contradiction to the Masoretic text. Jean Morin, on the side of the Catholics, argued that the Samaritan text corresponded with the Latin Vulgate and the Septuagint, two translations popular with the Catholic Church. Scholars in support of the Masoretic text, have questioned the scribing and handling of the Samaritan text, stating the text has been popularized and expanded. Now, almost 400 years later, the debate still continues with biblical scholars. The New Testament is slightly more complicated to break down. Our translations stem from two major sources, the Alexandrian text types and the Byzantine text types. There are also Caesarean and Western test types, but those have been proven to be descendants of the other two. The Alexandrian text types are the oldest known sources of the New Testament. There are two complete copies of the New Testament in Greek dating back to the 5th century and fragments found to be from the 3rd century. The first of the two complete New Testament manuscripts is the Codex Sinaiticus, a 400 page early text containing portions of the Old Testament in Greek and the complete New Testament. The second is the Codex Vaticanus, a 759 page manuscript containing the Old and New Testaments in completion. But while these Alexandrian texts date back earlier than their Byzantine counterparts, they only represent 5% of known manuscripts. The other 95% of existing manuscripts are from the Byzantine text type, otherwise known as the “majority text”. The Byzantine texts, while dating almost 200 years younger than the Alexandrian, are 5% bigger in volume of text. While the exact cause for the variance is still in question, the general consensus is that the either the Byzantine was expanded or the Alexandrian was abbreviated. While no proof of either exists, the expansive size of Byzantine works would make it less likely for changes to be made. And compared to Alexandrian manuscripts, the Byzantine consist of more polished Greek and have less textual variations. “They are less likely to present contradictory or "difficult" issues of exegesis. For example, Mark1:2 reads "As it is written in the prophets..." in the Byzantine text; whereas the same verse reads, "As it is written in Isaiah the prophet..." in all other early textual witnesses. Since the quotation introduced is partly from Malachi, the Byzantine form of the verse avoids the difficulty that might be adduced were it to be concluded that Mark was presenting a factual inaccuracy.” (McPherson). Given the size, consistency, and totality of the manuscripts, I believe the Byzantine texts would appear to be the more reliable source for translation. The second factor in composing a Bible is the translation method. There are three main avenues for translating scripture; formal equivalent, dynamic equivalent, and free translation. The first, formal equivalent, is a literal style of translation that puts a priority on keeping the exact words and phrases from the original text. The translators follow the scripture word for word in an effort to maintain the original text. These efforts, while maintaining accuracy due to their exactness, can sometimes create a difficult to read text when changing languages. The ASV, ESV, and KJB are just a few edition of the Bible that utilize the literal translation method. The dynamic equivalent method is used amongst the NIV, NAB, NLT, and the Amplified Bible. The Living Bible and The Message are two Bibles that are products of the free translation technique. These Bibles use paraphrasing, or attempt to translate ideas from the original text without being bound by literary translation. These Bibles tend to be more readable while sacrificing accuracy. Scholars refer to this style as idiomatic translation, or place it at the extreme end of the dynamic equivalent spectrum. The final component to be addressed is the reading level. There are many different formulas to designate a reading level to a Bible. Whether the Fry Formula, the Fog Scale Level, or the Flesch-Kincaid Grade Level system is used, it seems the results are very comparable. There are a group of Bibles that are translated into a vocabulary geared to an elementary education. The Good News Bible, New Century Version, and the New International Reader’s Version are all member of that group. These Bibles are mainly utilized with youth, prison ministry, and for readers that English is not their native language. The reading level for these Bibles range from 2.5-5 on the various scales. After the first group of Bibles, the reading level increases mostly in line with the translation method and not as much related to the target audience. The dynamic equivalent Bibles tend to rest more in the 6-9 reading level range, with the NLT averaging about a 6 across the metrics and the NIV mostly earning a 7. Entering the higher level reading translations, the ESV, RSV, and KJV appear. All three of these Bibles have been assigned a high school reading level grade related to their formal translation. While the level or levels identified by the varying formulas are to be merely used as a guide, readers can find an appropriate Bible for studying the scripture. Once an individual understands these three properties of the Bible and how to utilize them, they should be able to make an educated and informed decision in choosing their translation for studying scripture. Even better, the individual could choose multiple versions for studying and apply the knowledge of biblical composition to acquire translations that vary in origin, or differ in translation method, that would provide a more well-rounded educational experience in the word. The current translations available are always adapting, may that be due to changes in vernacular or position changes by biblical scholars. But the three core components will always remain and by using origin, translation method, and reading level to make a choice in translation or critique a specific version, readers of the Bible can be confident in their source for scriptural study. Dyas, Dee, Esther Hughes, and Stephen Travis. 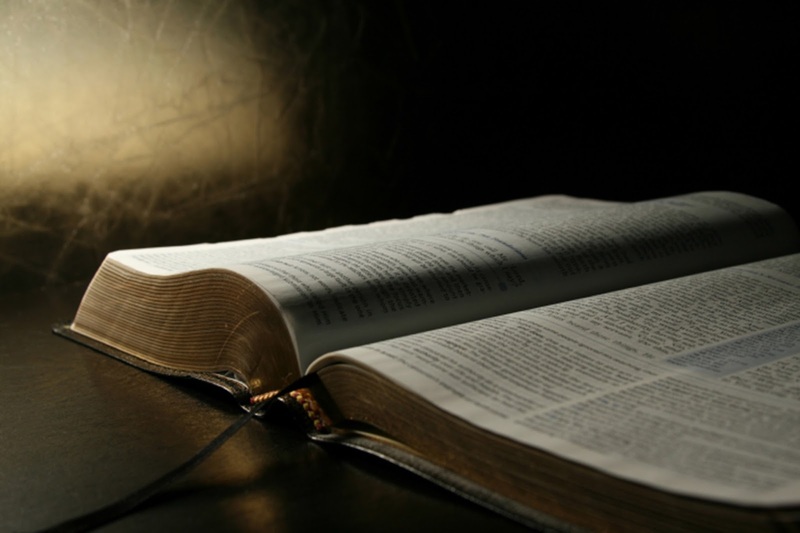 The Bible in Western Culture: The Student's Guide. London: Routledge, 2005. Print. Fee, Gordon D., and Mark L. Strauss. How to Choose a Translation for All Its Worth: A Guide to Understanding and Using Bible Versions. Grand Rapids, MI: Zondervan, 2007. 111. Print. Green, Joseph L. "20." The Power of the Original Church: Turning the World Upside down. N.p. : Shippensburg, PA, 2011. N. page. Print. American Bible Society." Religion Past and Present (n.d.): n. pag. State of the Bible 2015. The American Bible Society, Feb. 2015. Web. Oct. 2016. Labels: bible translation, can we trust the bible?, how was the bible translated?, is the bible reliable?, which Bible translation is the best? 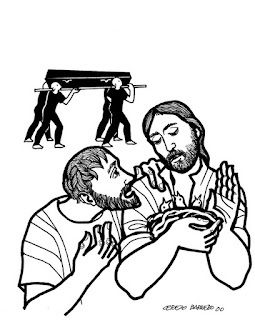 Why did Jesus say "Let the dead bury the dead?" (Luke 9:60)? After I finished preaching one Sunday, I had two young men approach me and said the Lord had called them into the ministry, and they asked if I had any advice for them. I said, “Yes, I can give you my advice in one word: OBEY!” I think this is perhaps the single greatest word of advice anyone could have for discovering and remaining in God’s will. Unfortunately it is also one of the areas of greatest difficulties for so many of God’s people. We are like sheep—prone to wander and amazingly stupid. We are like donkeys—stubborn and willful. We are like peacocks—proud and vain. We are quick to analyze and rationalize but slow to obey. We are masters of procrastination and experts at justification. Making excuses comes naturally to us, but simple obedience seems so difficult. I love the way Luke describes this same event in his Gospel. “And when they had brought their ships to land,” he says, “they forsook all, and followed him” (Luke 5:11). Immediately they left their nets. Immediately they left their boats. They forsook everything and they followed Jesus. What a response! Something stirs in my soul when I read this. I want to jump up with those men and abandon everything to follow the SON of GOD wherever He goes. This is what that other unnamed young man was missing. The opportunity of a LIFETIME only happens in the LIFETIME of the opportunity. There is a season for everything… Make a decision right now to say YES when God calls your name!!! Written by: Pastor Eli Hendricks M.Th. 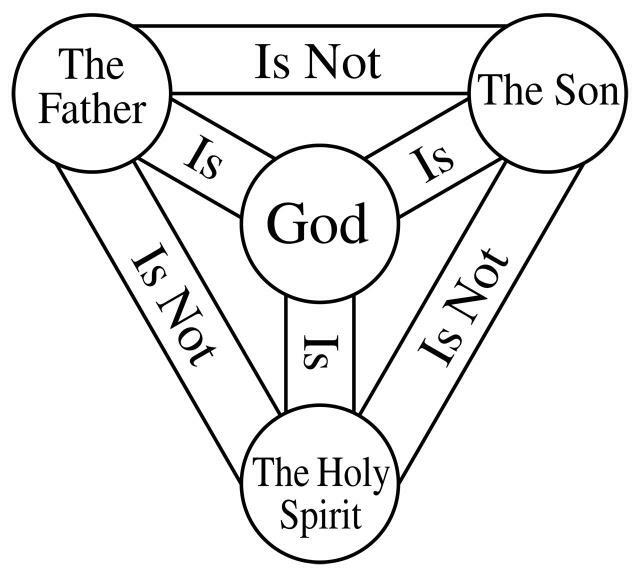 The doctrine of the trinity (tri-unity) of God is a Christian doctrine that describes the triune nature of God. It states the following: There is One God which is comprised of three separate, equally divine, wholly unified person's called the Father, the Son, and the Holy Spirit. The three are One in essence, nature, and union, but are separate person's who perform different functions in total unity with one another. Saint Patrick described the trinity as comparable to the three separate leaves on the One unified Irish clover. John 14:26, "These things I have spoken to you, while abiding with you. "But the Helper, the Holy Spirit, whom the Father will send in My name, He will teach you all things, and bring to your remembrance all that I said to you." Rev. 2:7, "He who has an ear, let him hear what the Spirit says to the churches. To him who overcomes, I will grant to eat of the tree of life, which is in the Paradise of God." NOTE: Historic Christian doctrine teaches that Jesus Christ, beginning from His incarnation, has two natures (the hypostatic union); He is fully divine and fully human at the same time (John 1:14). Therefore you will see certain passages of scripture referring to Jesus from the standpoint of His humanity by describing the Father as his God, etc. and you will also see passages like the ones mentioned above that clearly reference Jesus' divinity and therefore confirming His equal position with God the Father and the Holy Spirit from eternity. So in the above passage we see the person of God the Son being baptized, the Person of God the Father saying "this is My Son in whom I am well pleased," and the Person of God the Holy Spirit descending upon Jesus like a dove. I hope that this article was helpful in your study of the truth. 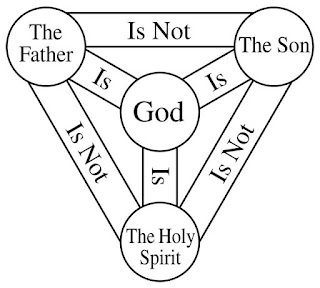 Remember, the doctrine of the trinity is among those components of God's Word which are ultimately beyond our understanding, this article is simply intended to initially describe the basics of this scriptural reality. God bless! The term “spirit of Jezebel” is referring to an evil spirit that Satan uses to cause defilement and division among God’s people. Believer’s can be either “oppressed” by this spirit or “influenced” by this spirit, or both. Ephesians 6:12 says “For our struggle is not against flesh and blood, but against the rulers, against the authorities, against the powers of this dark world and against the spiritual forces of evil in the heavenly realms.” In order to stop tolerating this evil spirit in our lives we have to learn the spiritual truths necessary from God’s word that empower us to defeat it! In this article will discuss identifying this spirit, submitting to God, and overcoming it. We will also learn what it means to have and operate in our spiritual authority as believers. So the woman Jezebel in the Old Testament is known for the treachery that she caused throughout the land of Israel during the reign of Ahab her husband. She set up altars to Baal and Ashterah (false idols) which instituted rituals of human sacrifice and Temple prostitution all throughout the country (compare to our current practices of abortion and rampant affirmation of sexual sin). Jezebel also killed off many Godly Prophets during her time of influence. Her husband Ahab basically stood to the side and allowed her to conduct evil throughout the land, so the Bible says that Ahab was considered Wicked in the sight of God. People who are being oppressed by The Jezebel spirit exhibit some of the same symptoms as the Prophet Elijah after his battle with the prophets of Baal at Mount Carmel in 1st Kings chapter 18. When a spirit of Jezebel seeks to oppress a man or woman of God it will always use fear and intimidation as you will see in the passage below. Submitting to God is the next point that we will cover. We can’t expect to win a spiritual battle if we are submitted to the enemy from the start. If we are living a lifestyle that is inconsistent with the living that God calls us to in His Word we are considered to be "submitted to the enemy." Submitting to God and His Word empowers us to resist the devil. Here in Matthew 4 we see Jesus helping us to understand that God's word is spiritual food for our spirit man. When we daily feed on God's word we are able to receive power from it in order to resist the enemy and win the spiritual battle. We are submitted to God when we rely on, trust, and obey His Word. If we are living in sin we cannot win. In order to submit to God we must repent, confess our sins, and fully surrender every part of our life to God on a day-to-day basis. In this passage (which proceeds right after his Jezebel encounter) the Prophet Elijah ate the bread which represents God's word and drank the water which represents God's Spirit. This gives us the principle that we must learn to live by. I believe that when we are facing spiritual warfare the only way out is to go deeper into God's Word, and rely more fully on God's Spirit and we ever have before. This means no more surface-level Christianity, this is when we must transition from just acting like Christians to actually being who we are called to be, more than conquerors! Identifying the spirit of Jezebel and submitting to God is critical, but we must also know our authority in Christ and have the drive to use it as we resist the devil through God’s power. When we understand the authority that we have in Christ and we are empowered by God with a passion to walk in the fullness of his glory, we can begin to walk in the victory that Christ intends for us to have. Mark 16:16-18 extends this promise to all believers. We are also said to be in union with Christ and therefore sharing in His authority (1 Corith 6:17). When we really begin to understand all that Christ has given us through His death burial and Resurrection, the powers of the enemy begin to be put into proper perspective. We begin to realize that the enemy has no power at all unless we behave as if he does! The “Ahab attitude” is alway needed in order for a Jezebel spirit to thrive. Ahab was basically an enabler for Jezebel's treachery to be acted out upon the entire nation of Israel. God has called men and women to stand up to the spirit of Jezebel and no longer tolerate it's deceptive ways in our life. God can remove an Ahab attitude from us when we confess our sin and ask Him to help us move in the better direction. If you are facing the influence of a Jezebel spirit in a family member or friend: seek wise counsel, address the behavior without attacking the person, let God’s word strengthen you, and pray like never before! In second Kings chapter 9 God anointed a man named Jehu to defeat Jezebel totally and completely. So what was it about Jehu that caused him to stand up to Jezebel rather than to be the enabler that Ahab was? I believe this answer is found in second Kings chapter 10. The word for "zeal" (Hebrew)- “qinah (kin-aw)” Means “God’s Holy jealousy for the devotion of His people.” By understanding this, we can see that God put within Jehu the passion for Holiness, devotion, and love that was needed in order to propel him into action for the kingdom of God. If we find that we have really had a hard time putting into action the things that God's Word calls us to do, it may be that we have lost our zeal. The good news is that when we repent and confess our sin God will restore our zeal and give us exactly what we need to live the Godly life that we are called to. Some have knowledge of the Word but no zeal, others have zeal but no knowledge of the Word. WE NEED BOTH in order to overcome spiritual warfare!!! We get both when we encounter Christ in all of His glory!!! 30 Then Jehu went to Jezreel. When Jezebel heard about it, she put on eye makeup, arranged her hair and looked out of a window. 31 As Jehu entered the gate, she asked, “Have you come in peace, you Zimri, you murderer of your master?”32 He looked up at the window and called out, “Who is on my side? Who?” Two or three eunuchs looked down at him. 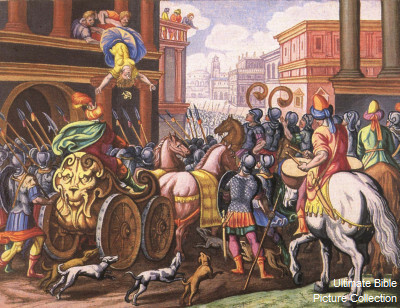 33 “Throw her down!” Jehu said. So they threw her down, and some of her blood spattered the wall and the horses as they trampled her underfoot. The last two things of the spirit of Jezebel will try to do in order to stifle the plan of God in our life is to try to make sin look pretty and try to heap condemnation upon us. We see this Illustrated and Jezebel putting on her makeup and then accusing Jehu of murder. This was a ploy to try to seduce him and then stifle him with shame and guilt from a false accusation. The enemy tries to do this in our lives as well but the Word of God gives us the tools to overcome the enemy in this area. Revelation 12:11- “They triumphed over him (the devil) by the blood of the Lamb and by the word of their testimony; they did not love their lives so much as to shrink from death. So we can see that through the blood of Jesus and our testimony to His word and all that it tells us about our forgiveness and Redemption through Christ, we are able to overcome the enemy! God is for us, we all face spiritual warfare and the attempts of the enemy to oppress us through a Jezebel spirit. We must remember that Greater is He that is in us than He that is in the world. We must learn discernment through the Word, repent of sin, submit to God, resist the devil and he will flee. Thanks for reading! Written by: Kyle Bailey M.Th. What does it mean to "Grieve the Holy Spirit?" Ephesians 4:30 says, "And do not grieve the Holy Spirit of God, with whom you were sealed for the day of redemption." The question of how God feels about us when Christians sin has tugged at and sometimes plagued people's heart for centuries. Does God feel angry at us? Does he feel disappointed? What does it mean for Him to be grieved? The way in which we answer this question can play a direct role in our spiritual health and maturity as believers. Hebrews 11:6 says, "And without faith it is impossible to please God..."
If it impossible to please God without faith then it logically follows that it is impossible to displease God when we have it. For example, as a father when one of my three sons does something wrong does it cause me to be disappointed in them, or their actions? That is, should I change the way I love them as my son just because they had bad behavior? No! What does happen is this: I am grieved by their behavior because it is harmful and self-destructive to their well-being, but I still love them just as much as I did before they had bad behavior. To build up resentment and bitterness toward my children for their behavior would in and of itself be a sin (see Hebrews 12:15). Galatians 3:6 says, "So in Christ Jesus you are all children of God through faith..."
Through faith we are placed in a position of being considered "children of God." This faith is the "faith that pleases God (see Hebrews 11:6)." In the same way that I still love my children when they do wrong, God still loves us when we do wrong. But also in the same way that I am "grieved" by my children's behavior when they do wrong, God can also be grieved by ours as well. So I will say this to you: even when you sin, God is pleased with you because of your faith. But simultaneously God is grieved with your sin when you commit it. This is why we are called to "confess our sins" when we commit them (see 1 John 1:9). It restores the proper balance in our relationship with the Father. As a good father disciplines his children to a state of remorse and confession when they do wrong, so does our Heavenly Father in the most Holy and appropriate way (see Hebrews 12:6). The word used for "grieve" in Ephesians 4:30 is the Greek word "lupeó (loo-peh'-o)." It means "to experience deep, emotional pain (sadness), i.e. severe sorrow (grief)." 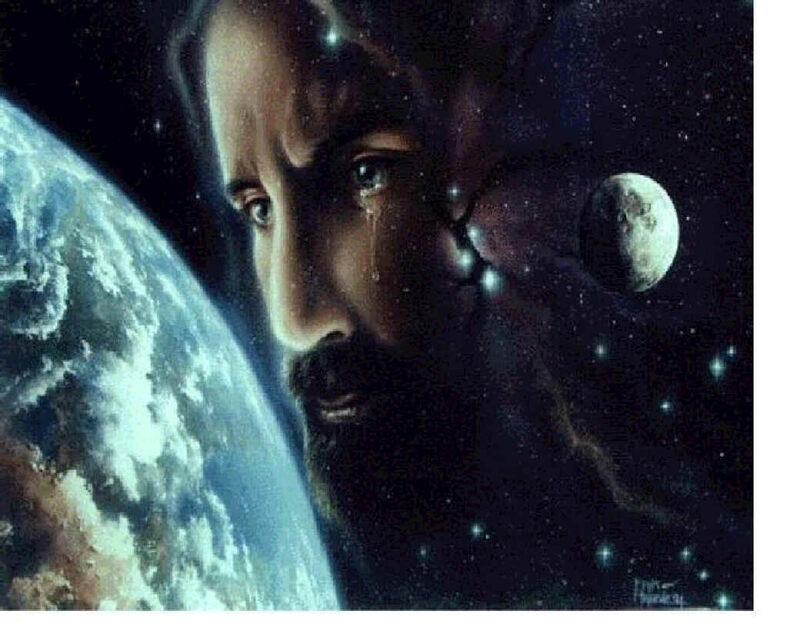 So instead of God feeling a sense of disappointment, anger, or hatred when believers sin, we are told that he feels a deep feeling of emotional pain, He is grieved. This realization helps us to see how deep God's love for us truly is. It is so deep that when we do things that are harmful and ultimately self-destructive God feels deep pain on our behalf because He wants what is supremely good for us. This realization also helps us to put God in a proper perspective when we sin and as Romans 2:4 says, let the "kindness of God lead us to repentance (paraphrased)." As we begin to realize that God is pleased with us on the basis of faith alone (Hebrews see 11:6) and that we have been made righteous through faith in Jesus Christ (see Romans 5:1), we can have certainty that God never turns His back on us when we fall short in our lives. God is more grieved about the blessings we miss out on when we sin than He is angry at us as His children. If you feel like God is angry at you, like God wants nothing to do with you because of your sin, know this: "whoever comes to me I will never cast out (John 6:37)." Through faith we have received reconciliation with God (see Romans 5:11), and when we sin we have an advocate before the Father who intercedes on our behalf (see 1 John 2:1). Knowing that God loves us in a constant, unending way enables us to confess and forsake our sin in a healthy manner (Romans 2:4, 1 John 1:9)! Be sensitive to when you feel the Holy Spirit being grieved by your actions, understand that He still loves you, and quickly repent. God stands ready to lavish His love upon us when we come to the throne of grace with boldness (see Hebrews 4:6)! God bless. Jesus Christ is arguably the most famous historical figure in all of the world. We use a reference to him (B.C.- before Christ) in order to track the years of history itself! There are many opinions among different religions and groups of people as to who Jesus was. The Muslims believe he was one of many prophets, the Orthodox Jews believe that he was a good teacher, and most people in the secular world believe that he was simply an important religious leader like any other person who is credited with founding a major world religion. But who did Jesus say He was? clearest examples of Jesus claiming to be God is found in John 10:30-33 where Jesus says, "I and the Father are one." And the the passage goes on to elaborate specifically on the meaning of Jesus statement saying, "The Jews took up stones again to stone Him. Jesus answered them, "I showed you many good works from the Father; for which of them are you stoning Me?" The Jews answered Him, "For a good work we do not stone You, but for blasphemy; and because You, being a man, make Yourself out to be God." So here we can see clearly that Jesus, in saying the He and the Father are "One" was claiming absolute divinity, and doing so publicly for all to hear. Another famous instance in which Jesus claimed to be God can be found in John 8:58 where is says, "Jesus said to them, 'Truly, truly, I say to you, before Abraham was born, I am.'" In order to uncover what Jesus was indicating by assigning the "I am" title to Himself, let us go to Exodus 3:14 and take a look at what this title actually signifies, "And God said to Moses, 'I AM WHO I AM'; and He said, Thus you shall say to the sons of Israel, ‘I AM has sent me to you.’" So we can see that in order for Jesus to assign the title "I am" to Himself is to actually equate Himself with the exact same God who spoke to Moses through the burning bush. This passage clearly documents a direct claim to divinity by Jesus Himself. 1 Corinthians 15:3-8- " For what I received I passed on to you as of first importance: that Christ died for our sins according to the Scriptures, that he was buried, that he was raised on the third day according to the Scriptures, and that he appeared to Cephas, and then to the Twelve. After that, he appeared to more than five hundred of the brothers and sisters at the same time, most of whom are still living, though some have fallen asleep. Then he appeared to James, then to all the apostles, and last of all he appeared to me also, as to one abnormally born." In any court of law, to have 1 or 2 eye-witnesses is proof enough to convict someone of a crime. In the case of the resurrection of Jesus, we have a total of 513 eye-witnesses. The evidence far exceeds what is needed to have beyond a reasonable doubt regarding the resurrection of Christ. In fact, I would submit that one has no real excuse for rejecting the clear documentation that indicates overwhelmingly that Christ did rise from the dead, thus proving His authenticity as the God and Savior of the world. People will die for what they believe to be true, but nobody in their right mind would die for something they know to be a lie, especially 513 total witnesses. To deny this evidence is to suppress all faculties of reasoning, which shows us that when a person denies the resurrection of Christ in light of it's evidence they do not do so based upon logic or reason but rather based upon a personal bias or some other inclination that is completely without basis or excuse. Above and beyond the opinions of many different groups and religions we find the testimony of Jesus Himself contradictory to each of them. We find that Jesus unequivocally claimed to be God incarnate. We also find that even a cursory study of the initial evidences pointing to the authenticity of Jesus' claims gives us sufficient proof to believe that Jesus is who He says He is. The Bible tells us that the way we answer the question of "who Jesus is" is the most important thing in our entire life. Through believing in Him and His words we can have eternal life (John 3:16). So how will you answer this question? Will you say yes to Jesus today? Labels: Did Jesus claim to be God?, God in the flesh, God-incarnate, Is Jesus God?, the diety of Christ, the divinity of Christ, the hypostatic union, where did Jesus claim to be God?